REITs are the sure fire value generator you might think they are in gaming. The Park in front of T-Mobile Arena will now be owned by MGM Growth Properties. Image source: MGM Resorts. MGM Resorts (NYSE:MGM) has officially sold some of its real estate to a REIT, known as MGM Growth Properties LLC (NYSE:MGP), raising $1.05 billion in the process. The move has been a long time coming and continues a REIT trend for the gaming industry. But it may not be as straight forward of a value creator as you might think. Penn National Gaming (NASDAQ:PENN) started the gaming REIT trend in the U.S. with the launch of Gaming and Leisure Properties (NASDAQ:GLPI). The REIT has now become a dominant real estate owner in the regional gaming market after agreeing to acquire Pinnacle Entertainment's real estate. Whether or not Penn National gained any value from the spinoff is debatable. You can see below that since the spinoff was completed the gaming company has performed only slightly better than MGM and the REIT has underperformed. In the MGM Growth Properties IPO, MGM will contribute real estate from Mandalay Bay, The Mirage, New York-New York, Luxor, Monte Carlo, Excalibur, The Park, MGM Grand Detroit, Beau Rivage and Gold Strike Tunica. And for those assets MGM will be able to reduce debt by at least $4.0 billion. But there are also some downsides to the gaming REIT craze. 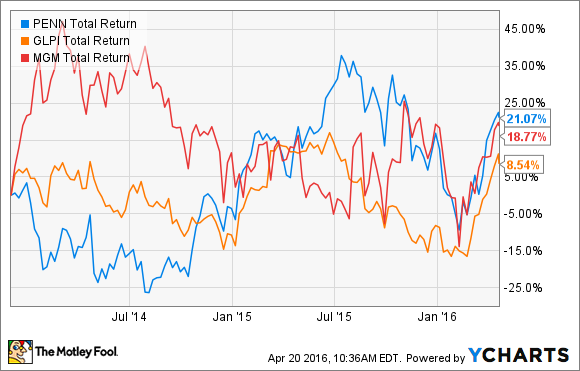 Are REITs really good for gaming companies? The push for REITs has been driven by short-term investors like hedge funds and even investment bankers, who take a cut of every transaction. In MGM's case, hedge fund manager Jonathan Litt has spearheaded the drive for a REIT spinoff. But it's uncertain whether or not REITs really create a lot of new value for gaming companies long-term. The new MGM Resorts will be even more leveraged to its gaming operation, unable to fall back on billions of dollars in real estate value to placate debt holders. As part of the terms of forming the REIT, MGM will have to pay rent to operate its hotels, increasing fixed operating costs. In a recession, not having the flexibility to sell real estate or borrow against real estate could put the company at risk. On the plus side, in good times the balance sheet has even more leverage for any growth in revenue. One advantage could be the ability to pay down debt, reducing leverage on the balance sheet, if MGM decides to go with that strategy. As part of the MGM Growth Properties IPO, MGM says the REIT will assume $4.0 billion of bridge facility indebtedness and MGM will refinance its senior secured credit facility and repay senior notes due 2016. If the trend continues, MGM could be less leveraged than ever, which could be a good thing. One positive aspect of MGM Resorts' REIT is that the company will own 73% of outstanding shares, if underwriters exercise the over allocation. So, it has complete control of the company. But long-term the interests of real estate holders and gaming companies may not necessarily align, creating a conflict for the two companies. For example, if New York-New York casino ages to the point where tearing it down and building a new resort would be best for MGM, what is it in the REIT's best interest to do? Since the real estate is the biggest differentiator from one casino to another, having someone else own the assets is a risk. MGM has clearly decided that the risk of spinning off real estate into a separate company is a good idea. But keep in mind that the business is now more leveraged than ever to gaming and other revenue streams, potentially making it a riskier investment. Time will tell if it's a bet that pays off.